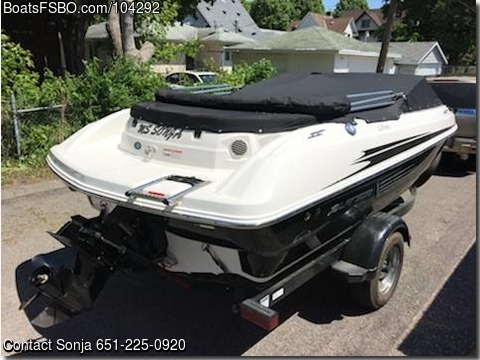 Boat is located in Saint Paul,Mn.Please contact the owner @ 651-225-0920..This boat is just like new, has a new 4.3 TKS motor, new battery and anew 3 blade propeller. It is all tuned-up and ready for the water. Tabs are good til 2020. Seats up to 8 people. Has a boarding ladder, fiberglass floor, swim platform, fixed cleats (4), walk-thru windshield w/side glass, ski tow ring. Snap in carpet, tilt steering. Electric bilge pump, gauges include: tachometer w/oil & trim indictor, speedometer w/fuel & volt indicator and temperature, horn, navigation lights, AM/FM radio, and depth finder. Bow storage compartments, bow seating cushions, floor storage, glove box, stern storage. Sport bucket seats 2-w/swivel & sliders, stern bench seating w/under cargo net storage, under console pocket netting storage. Trailer included: Galvanized LX3000 DB w/swing tongue, galvanized spare tire & carrier.